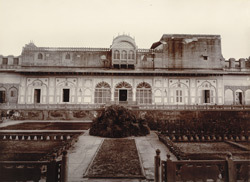 Photograph from the Curzon Collection, of Baldeo Singh’s Kacheri at Charbag, in Bharatpur, Rajasthan, taken by the studio of Priyalall & Company in c.1900. Bharatpur became the capital of the recently-founded Bharatpur State in 1733 under the rule of the Sinsini Jats. They built a fort, palaces and government buildings in the town, including this kacheri, or judicial court. Baldeo Singh (ruled 1823-1825) was the ninth Maharaja of Bharatpur. The kacheri and its garden setting are characteristic of Jat architecture, in particular the 18th-century palace complex at Dig which consists of arcaded pavilions set around a formal garden. The garden in the foreground is divided into parterres in the Mughal style known as a char bagh, which has presumably given its name to the place.